On Nov. 6 of this year, California voters will have the opportunity to vote on Proposition 37, which would mandate the labeling of genetically-engineered foods. However, mega-corporations such as Monsanto, joined in the fight by several additional key players, are passionately battling this bid for transparency. PepsiCo sodas rely heavily on an ingredient known as high-fructose corn syrup (HFCS), and considering the bulk of corn used in this process is GMO, PepsiCo’s interest in maintaining the status quo makes perfect sense (just imagine the blow to profits PepsiCo would suffer if every can of Pepsi came labeled with a GMO warning). When the Cornucopia Institute tested Kashi’s “Go Lean” cereal, they found that the added soy was 100 percent geneticallyengineered, a claim denied by Kashi. In Europe, Kellogg (and others) have dropped GMOs while simultaneously continuing their usage within the United States. In 2009, thousands of Silk soy milk customers were shocked to learn that the company had quietly removed the organic certification emblem and switched over to conventional soybeans. Not long after this revelation, a boycott was initiated and Silk quickly decided to change. The following year, all Silk soymilk, coconutmilk, and almondmilk products were enrolled in the Non-GMO Project‘s Product Verification Program and have since been labeled as such which essentially means that those products demonstrated all of its GMO risk ingredients were tested. Silk’s “light” soymilk products are made with soy flour instead of whole soybeans. The only known sources of conventional soy flour that are also suitable for soymilk are first produced by bathing soybeans in hexane to extract the oil. Hexane, classified as a “hazardous air pollutant” by the Environmental Protection Agency, is a byproduct of gasoline refining, and is also a neurotoxin. Dean Foods, the owner of Silk and one of the largest dairy corporations in the U.S., owns Horizon, a leading organic milk brand. Monsanto’s GMO alfalfa, corn, and soybeans are all used to feed dairy cows producing milk for Dean Foods. Dean Foods is also the primary marketing agent for Land O’ Lakes, a giant dairy, seed, and biotech company. How much has Monsanto donated so far to defeat Prop 37? Over $4,000,000. First, though vastly out-funded, there are nonetheless companies and individuals eagerly fighting to support Prop 37, a list which includes Nature’s Path, Dr. Bronner’s, Nutiva, Lundberg Rice, Organic Valley, Amy’s, Eden Foods, as well as Joseph Mercola of mercola.com, who has donated nearly a million dollars. 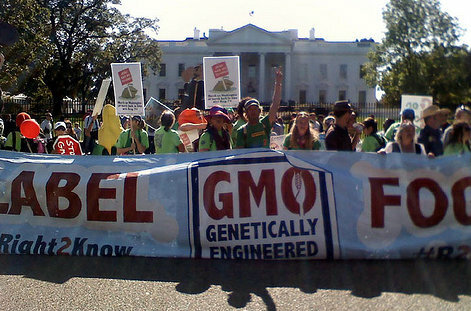 Second, polling data shows that 90 percent of the United States population want GMOs labeled. Even if the effort to mandate GMO labeling falls through, what has been made clear is that consumers want transparency and perhaps more important, easily hold the power to attaining it. Consumer boycotts, for example, have been proven very effective, and would likely send a clear message to the businesses which have seemingly chosen to put profits over consumer health. Those selling in this market would do well to listen to their customer base and certify (via the state or elsewhere) that their products are 100% free of GMOs.